Obesity is the excessive accumulation of adipose tissue in the body due to consuming more food than is required for energy. 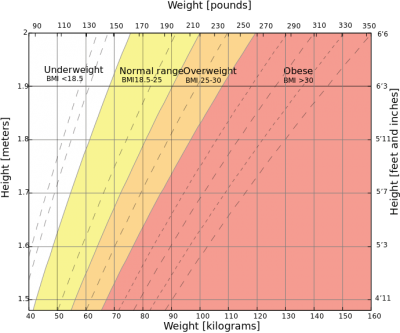 BMI should be used to classify obesity and you are deemed obese if you have a BMI of over 30kg/m . In 1980, 6% of men and 8% of women in England were deemed as obese. By 1995, these percentages had more than doubled, 15% of men and 16.5% of women were classed as obese. In 2010, 23.6% of men and 23.8% of women in England were obese. And the obesity levels in Scotland were slightly higher in women with 26% being obese. These recent statistics show that nearly a quarter of the UK adult population are obese and obesity is rising quickly, therefore it is not surprising that every year obesity in the UK costs the economy £3.5bn. According to the WHO in 2016 1.9 billion people were overweight, 600 million of these were obese and alarmingly 41 million children under the age of 5 were overweight or obese. Obesity is a significant risk for developing Type 2 Diabetes, with 90% of diabetes diagnosis being type 2. There are over 422 million people worldwide living with diabetes and in 2012 1.5 million people died as a direct result of this disease. Physiotherapists, as exercise experts, join the worldwide concern for the ever growing epidemic of obesity, which affects adults and children alike. It is probably one of the greatest challenges to our health systems around the world in the 21st century. There are two important interventions to prevent and manage obesity. One is optimal nutrition. The other is increased exercise and physical activity. The potential contribution of physical therapists to the latter approach is immense. Physical activity is any movement of the body that requires the use of our skeletal muscles, which in turn requires energy expenditure. This energy expenditure is basic to weight control. Aerobic exercise prescriptions and recommendations for strength/resistance training must go hand in hand with reduced food intake, and the progression of activity should be gradual, scientifically based, and tailored individually to each person. It is important that the physiotherapist finds the most appropriate activity for the individual, so that they will not only enjoy the activity but also have a greater chance of staying with it. There are numerous types of exercise prescriptions that the physiotherapist may use in their increasing effort to battle the obesity epidemic. The sooner all our nations begin to adopt initiatives and programmes to combat obesity and other diseases of civilisation, the less will be the burdens on health systems delivery around the world. Because obesity is reaching epidemic proportions, the topic of obesity is a core part in medical curriculums. This means that every time a health professional has the opportunity to see a patient, they should be able to assess the patient to see if they have a weight problem and either refer them to a specialist or offer simple advice. Physiotherapists have a key role to play in trying to reverse this trend as they often use exercise as a form of treatment, so if a patient is too overweight to do exercise, it becomes harder for the treatment to be successful. From the moment a physiotherapist meets an overweight patient who can’t do the exercises required for treatment, they should express their concern about their body weight and check their BMI. If the BMI is 25 or less the physiotherapist should provide health promotion information. However if it is between 25 and 28, they should offer simple weight control advice, such as amount of calories consumed in relation to physical activity levels. A physiotherapist should also ask about risk factors such as smoking, excess alcohol and possibly even take blood pressure. If the patient wants to lose weight, the physiotherapist should advise the patient to go to their doctor to devise a strategy for weight loss, which would include the help of other health professionals such as dieticians, nutritionists and behaviour therapy. On the other hand, if the patient does not want to lose weight the physiotherapist should advise them to maintain their weight and see their doctors for regular weight checks. One of the main roles of a physiotherapist regarding obesity is educating patients. Bird, states that many people are falsely led to believe that they can lose weight without putting in effort or changing from a sedentary lifestyle. Physiotherapists have to explain why that is not true, because if the patient doesn’t understand why this is incorrect, they will continue to believe it. Health professionals should encourage healthy eating, consisting on the 5 food types, information can be given to patients via the “eatwell plate” model. However, what good is offering this advice if health professionals don’t follow it? Physiotherapists should therefore “practice what they preach” and follow a healthy diet themselves. We should also make patients aware of the numerous benefits of modest weight loss benefits such as reduced risk of cancer and diabetes but also the holistic benefit of having an improved physical, social and mental well being. One of the most important things a physiotherapist must take into consideration is that they “should be appropriately trained and qualified to deliver the specific interventions and have ongoing specialist supervision where relevant”. If they don’t, they are liable to be questioned as they may have given out incorrect information. Physiotherapists are not responsible for setting goals or weight management programmes, therefore it is vital that they understand the importance of referral to a specialist. Lastly, physiotherapists should make patients aware about when they are more likely to put on weight, for example, pregnancy or the menopause so that the patient can prepare for it or at least not be surprised if it does happen. Lean, et al, suggests that health professionals should get involved with the food industry and the environment in order to try and promote physical activity, healthy eating and better self confidence. This would be extremely difficult to do because fast food companies are making their products for a profit, not for health issues. What they are doing now is making them a huge profit so why would they try to change when they are being very successful? ↑ 2.0 2.1 2.2 Haslam, D, Sattar, N & Lean, M (2007) Obesity- time to wake up. In: Sattar, N & Lean, M (eds.) ABC of Obesity. Oxford, Blackwell Publishing. ↑ Anderson, P & Butcher, K (2006) Childhood Obesity: Trends and Potential Causes, The Future of Children, 16 (1) Princeton University and The Brookings Institution. ↑ Crawley, J (2006) Markets and Childhood Obesity Policy, The Future of Children, 16 (1) Princeton University and The Brookings Institution. ↑ 9.0 9.1 9.2 Lean, M, & Lara, J & O Hill, J (2007) Strategies for preventing obesity. In: Sattar, N & Lean, M (eds.) ABC of Obesity. Oxford, Blackwell Publishing. ↑ 10.0 10.1 Bird, S (1992) Exercise Physiology For Health Professionals. London. Chapman & Hall. ↑ Avenell, A, Sattar, N & Lean, M (2007) Management: Part I- Behaviour change, diet and activity. In Sattar, N & Lean, M (eds.) ABC of Obesity. Oxford, Blackwell Publishing. ↑ National Institutes Of Health (1998) Clinical Guidelines On The Identification, Evaluation And Treatment Of Overweight And Obesity In Adults-The Evidence Report. NIH Publication No. 98-4083.